The Fly is a fictional comic book superhero first published in 1959 by Red Circle Comics. He was created by Joe Simon as part of Archie's "Archie Adventure Series" and later camped up (as Fly Man) as part of the company's Mighty Comics line. He first appeared in The Double Life of Private Strong #1; however, his origin story and first "full-length" appearance were in Adventures of the Fly #1 (Aug. 1959). 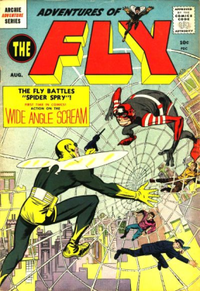 Adventures of The Fly was cancelled with issue #30 (Oct. 1964). The Fly also appeared in short stories in some of Archie's other titles (The Double Life of Private Strong #1 and #2 both published in 1959), (Pep Comics #151, 154, 160 and Laugh #128, 129, 132, 134, 137-139) between October 1961 and January 1963. His own series was restarted as Fly-Man as part of the "Mighty Comics Group", which ran from issues #31-39 (May 1965 - Sept. 1966). The title changed again to Mighty Comics, which featured various Archie super-heroes in solo adventures for #40-50 before its cancellation in 1967. The Fly was published again in the 1980s under the Red Circle Comics imprint, running from issue #1 (May 1983) to #9 (October 1984). The stories in this series were more similar to the previous stories in Adventures of The Fly and co-starred Fly Girl. With issue #5, Steve Ditko both wrote and drew the stories, which portrayed Tommy Troy being framed and discredited. Ditko left the series after issue #8, and another writer wrapped up the storyline in #9, which cleared Troy from any guilt. The Fly was one of the characters used in DC Comics' revamp of the Archie characters in DC's !mpact Comics line. This series, also called The Fly, ran 17 issues (Aug. 1991 - Dec. 1992) and portrayed the Fly as a boy (named Jason Troy) who turned into an adult superhero, similar to the original version of the character. Archie Comics reprinted the first four issues of the 1959 series in a 2004 trade paperback collection under the company's Red Circle imprint. In 1999, Joe Simon regained the rights to the character thanks to copyright termination. The termination did not affect Fly-Girl, since she was created after Simon and Kirby left the title. With the post Infinite Crisis reboot of the DC Comics continuity, and the subsequent licensing of the Red Circle comics characters and mark, a newly revamped version of the Mighty Crusaders were introduced. Since Archie Comics no longer owned the rights to the Fly, DC couldn't use the character. Instead, they used Fly-Girl, his female counterpart in the original '60 stories. Fly Girl has subsequently stood in for The Fly in Archie's 2012 New Crusaders series. Tommy Troy was an orphan hired by Ben (or Ezra) and Abigail March. Late one night, he tried wearing a ring with a fly-shaped emblem he found in their attic. The Marches were wizards, and the ring summoned Turan, one of the Fly People. Turan explained that, ages ago, the Fly People ruled the Earth. They used magic in their wars, in the ultimate one of which they reduced most of their population to common houseflies. Only a few Fly People managed to escape to another dimension, where they waited for "one person... pure of heart" to fight crime and greed, which were their own downfall. Tommy was that person. By rubbing the ring and saying "I wish I were the Fly," he exchanged bodies with the other dimension and became a costumed adult superhero. To return to his own identity, all he had to do was utter his name. The Fly was dressed in a predominately dark green leotard with yellow shorts and belt and a yellow over-the-head mask. A pair of goggle-like eye pieces covered his eyes and a set of "wings" were built into the collar area. Originally the wings were small decorations; when the character became capable of flight, the wings became larger and somehow fully functional. The Fly was one of the few 60's superheroes who carried a holstered weapon. The Buzz Gun, so named from the buzzing noise made when activated, was a handgun capable of dispensing non-lethal tranquillizer darts or stun rays, depending on setting. During the start of the Archie Comics run of the character, the Fly possessed only four talents: the ability to walk up walls, to see in all directions, to escape from any trap, and acrobatic agility. Later in the series a string of insect powers were gradually added; in his final realization the Fly possessed whatever power the world's insects possessed multiplied times an nth quantity. Prime examples were: strength of a million ants, flight as fast as a million flies, durability, the power to shatter materials by vibrating his "wings" in chirping cricket fashion, webbing spun from the small of his back, bio-luminescent light and "heat", resistance to radiation and the ability to mentally control insects. Later in the series when actress Kim Brand was provided her own Fly Ring powers, becoming Fly-Girl, she possessed the same roster of magical insect-themed endowments. Later both characters became capable of growing to skyscraper proportions or reducing to the size of an insect. These new powers were to remain during the rest of the Archie Series but were ignored during the Red Circle run. A TV series based on the Fly was in development at one point. The Fly at Don Markstein's Toonopedia. Archived from the original on July 30, 2016. This page was last edited on 24 December 2018, at 06:14 (UTC).